On Thursday, August 30th the Canadian government ordered U.S. Iraq war resister Kimberly Rivera, her husband Mario and their four young children deported to the United States. Kimberly served in Iraq in 2006, and sought refuge in Canada in 2007 after making the decision that she could no longer participate in the Iraq War. 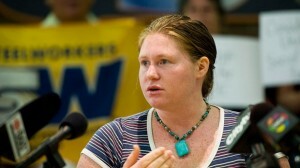 Kimberly was the first woman US Iraq War resister to come to Canada. She and her family live in Toronto. If deported, she faces harsh punishment. War resisters Robin Long and Clifford Cornell, two Iraq war resisters deported by the Harper government, were court-martialed and sentenced to 15 months and 12 months respectively for speaking out against the Iraq War. Canada’s Parliament has adopted two motions calling on the federal government to allow war resisters to stay in Canada. But Minister of Citizenship and Immigration Jason Kenney has publicly labelled Iraq War resisters as “bogus refugee claimants”. In July 2010, he issued a bulletin to all Immigration Officers requiring them to red-flag applications that involve US war resisters, labeling them as ‘criminally inadmissible’. The War Resisters Support Campaign is requesting donations to cover legal costs. If you wish, you can make a donation online.